136 Beacon is located on the north side of Beacon, between Berkeley and Clarendon, with 134 Beacon to the east and 138 Beacon to the west. 136 Beacon was designed and built by architect Charles K. Kirby ca. 1860, one of two contiguous houses (136-138 Beacon), designed as a symmetrical pair. They were originally numbered 118 Beacon and 119 Beacon, but re-numbered as 136 Beacon and 138 Beacon ca. 1862 when homes were built on the south side of the street. 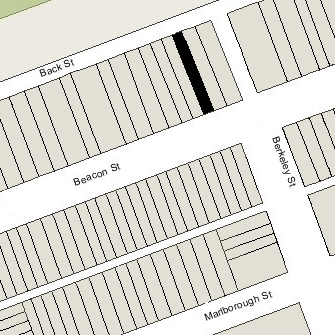 Charles Kirby purchased the land for 136-138 Beacon on March 31, 1859, from the Boston and Roxbury Mill Corporation. Click here for an index to the deeds for 136 Beacon. On January 4, 1860, 136-138 Beacon were purchased from Charles K. Kirby by Eliza Gill (Bradlee) Winchester, the widow of William Parsons Winchester. She lived at 136 Beacon and her son and daughter-in-law, Thomas and Ellen (Manson) Winchester, lived at 138 Beacon. Eliza Winchester’s husband, William Winchester, had died in August of 1850. Prior to his death, they had lived on Franklin Place in Boston and also maintained a home in Watertown, which became her primary residence. He had been a partner in the wholesale merchant firm of E. A. & W. Winchester, founded by his father, which dealt in soaps, candles, and other provisions, and were the manufacturers of Winchester soap. The town of Winchester, incorporated in 1850, was named in his honor. Eliza Winchester continued to live at 136 Beacon until her death in September of 1890. 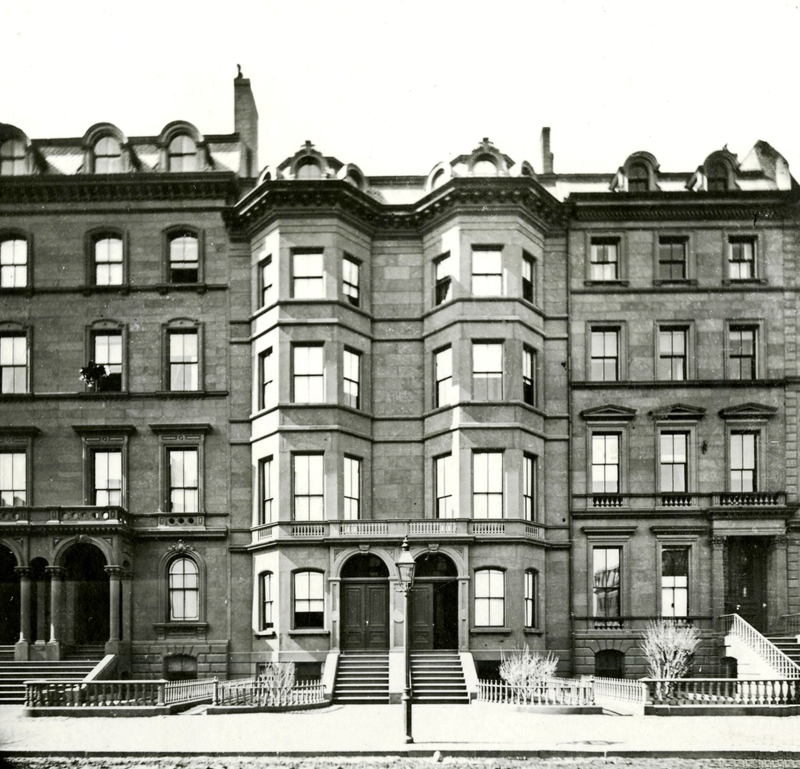 136 Beacon was not listed in the 1891 Blue Book. On April 20, 1891, 136 Beacon was acquired from Eliza Winchester’s estate by Grace (Oakes) Brooks, the wife of Frederick Brooks. They had married in June of 1890. Prior to their marriage, he had lived at 97 Beacon with his parents, Francis Brooks and Louise (Winsor) Brooks. Frederick Brooks was a designer of stained glass. Frederick and Grace Brooks continued to live at 136 Beacon for the next forty years and raised their two children, Grace and Francis, there. On several occasions they were traveling or living elsewhere during the winter season and 136 Beacon was the home of others. During the 1900-1901 winter season, it was the home of cotton broker and manufacturer Charles Bean Amory and his wife Lillie (Clapp) Amory. Their primary residence was in Milton. During the 1904-1905 season, it was the home of James J. Jackson, Jr., and his wife, Rachel (Brooks) Jackson, who had married in June of 1904. Their eldest child, James, was born in April of 1905 while they lived 136 Beacon. They moved soon thereafter to Westwood. James Jackson was an investment banker and later would serve as Treasurer of Massachusetts. During the 1912-1913 season, 136 Beacon was the home of investment banker Barrett Wendell, Jr. and his wife, Barbara (Higginson) Wendell. They previously had lived at 265 Clarendon. By the 1913-1914 season, they had moved to 248 Marlborough. In June of 1918, the Brookses’ daughter, Grace, married John Grimes Butler. He was serving as a Lieutenant in the US Army and sailed for Europe the next month. Grace (Brooks) Butler lived with her parents at 136 Beacon. After his discharge, they continued to live with her parents during the 1921-1922 winter season, but moved thereafter to Connecticut. 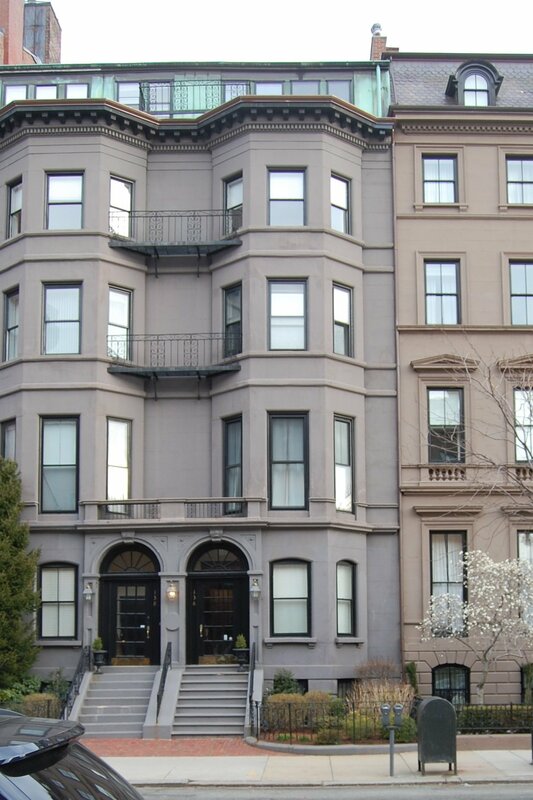 Frederick and Grace Brooks and their son, Francis Brooks, an investment banker, continued to live at 136 Beacon. During the 1923-1924 and 1924-1925 winter seasons, the Brookses were joined at 136 Beacon by William Davies Sohier, Jr., and his wife, Elaine (Denegre) Sohier. They also maintained a home in Manchester. He was an attorney and officer of the Old Colony Trust Company. During the 1928-1929 season, the Brooks family was living elsewhere and 136 Beacon was the home of Cyril Bathurst Judge and his wife, Anna (Lyman) Judge. Cyril Judge was an instructor at Harvard and expert on Elizabethan English. Their primary residence was in Newport at Sulthorne, the estate built by Anna Judge’s father, Charles Lyman. By 1930, they had made 328 Beacon their Boston home. On July 31, 1931, 136 Beacon was acquired from Grace Brooks by Robert F. Wilkins, an insurance broker. He and his wife, Florence (Dillon) Wilkins, lived in Dorchester. Frederick and Grace Brooks and Francis Brooks continued to live at 136 Beacon during the 1931-1932 winter season, leasing the house from Robert Wilkins. Frederick Brooks died in February of 1932, and Grace Brooks and Francis Brooks moved soon thereafter. Grace Brooks married again in September of 1933 to investment banker and stockbroker Philip Van Rensselaer Ely; after their marriage, they lived in an apartment at 66 Beacon and in Pomfret, Connecticut (they traveled abroad soon after their marriage and were living in Monte Carlo at the time of his death in January of 1936). On August 17, 1932, the Massachusetts Hospital Life Insurance Company foreclosed on its mortgage to Robert Wilkins and took possession of 136 Beacon. On January 30, 1934, 136 Beacon was acquired from Massachusetts Hospital Life by Edith Pearl (Spencer) Hansen, the wife of John A. Hansen. They lived in Waltham. 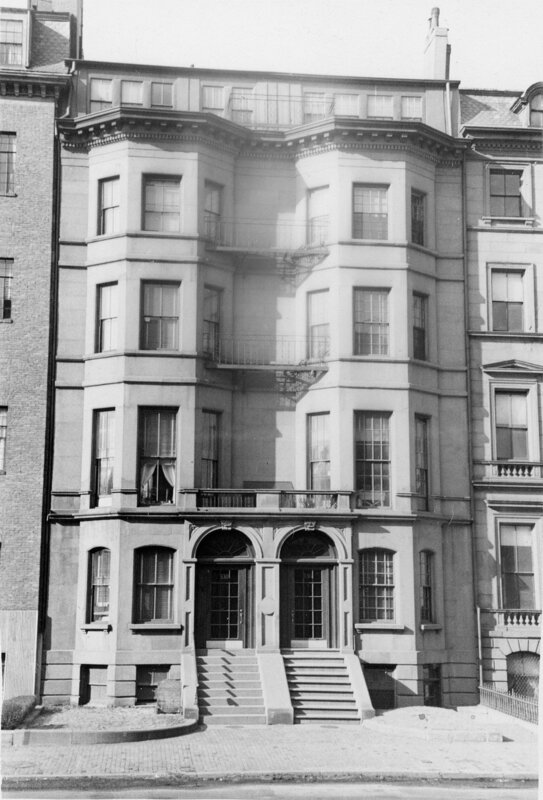 In September of 1934, she applied for (and subsequently received) permission to convert the house from a single-family dwelling into “small light-housekeeping suites.” She began the work but abandoned it and, on January 3, 1936, the Massachusetts Hospital Life Insurance Company foreclosed on her mortgage and once again took possession of the property. 136 Beacon was shown as vacant in the 1933-1936 City Directories, and was not listed in the 1933-1937 Blue Books. Immediately after taking possession, the company filed for (and subsequently received) permission to convert the house into ten apartments. At about the same time, the owners of 138 Beacon also converted their property into ten apartments. As part of the remodeling of both houses, the original dormers were removed and the fifth floor expanded and modernized. Plans for remodeling the houses, prepared for real estate dealer Overton W. Oglivie by John J. Mahoney, civil engineer, are included in the City of Boston Blueprints Collection in the Boston Public Library’s Arts Department (the reference for 136 Beacon is BIN P-134 and the reference of 138 Beacon is BIN P-131). On March 29, 1940, 136 Beacon was acquired from Massachusetts Hospital Life by Frank Maltman of Cambridge. The property subsequently changed hands and on April 7. 1955, was acquired by the Myrtleside Realty Company, Inc. It also owned 138 Beacon, which it had acquired in May of 1948. On August 15, 1963, 136 Beacon and 138 Beacon were acquired from Myrtleside Realty by Paul V. Amon, owner of the Atlas Terminal warehouse, and his wife, Dorcas (Wetzel) Amon. They lived in Milton. On August 15, 1963, 136 Beacon was acquired from Paul and Dorcas Amon by John V. Kunigenas. The Amons retained 138 Beacon. In July of 1979, he filed to legalize the occupancy of 136 Beacon as 12 apartments.